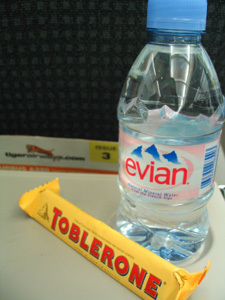 I never really considered Tiger Airways, even when I’m trying to be cheap with my budget. That is primarily because flying via Tiger in the Philippines meant having to go to Clark. Even with the shuttle service from Megamall, I still see it as a hassle, particularly since I live in the northern part of Metro Manila. However, when my sister-in-law told me about the special promotion Tiger Airways was having, I immediately changed my opinion. Well, it was actually because it’s for the Thailand leg of the trip. That was in the middle of January, their SG$9.98 promo. Similar to Cebu Pacific‘s Php 10 and Piso fares, the base rate for a one-way ticket is SG$9.98 (depending on the destination) plus applicable taxes. For my roundtrip ticket to Bangkok originating from Singapore, it came down to SG$103.21 or Php3,320.00. The catch in these types of promotions is that you have to book months before your departure. Usually, tickets sold during these promos are non-transferable and non-refundable. There are also conditions regarding changes in your itinerary and higher fees for the changes made. But if you’re like me who plows ahead with my plans, their promo is perfect for you. To maintain lower fares, Tiger Airways has moved to Changi Airport’s new budget terminal. The terminal is only 5 minutes away from Terminal 2, and there’s a shuttle service to and from both terminals. Like Jetstar Asia, Tiger Airways uses A320 planes with the 3-3 configuration with non-existent legroom. Refreshments are sold on board, as well as duty free merchandise. Unlike Jetstar though, Tiger Airways doesn’t have assigned seats, so it can get pretty crazy. All in all, I’d still fly Tiger Airways to get around South East Asia. Just maybe not from the Philippines. Sounds like a good deal w/ Tiger, but I don’t think I can handle not having assigned seats! I can see that being a problem w/ families who like to travel together. Also, legroom is a MUST. As they say, you get what you pay for. But overall, they’re really great deals, both Jetstar and Tiger. Their strictness with time ensures that you’ll be on your destination on time, which is specially handy if you’re taking a connecting flight. i also got my ticket from Tiger Airways..we’re flying to SG tomorrow. i was able to book for my friend and i…middle of january. like you..i always plan my trips really ahead of time..so this airline’s promo is perfect for me too. our round-trip airfare to SG cost Php3,500..a very good deal. Really? Only 3,500 for the round trip? Nice!